Let us imagine the utopian world where most of our work is done by machines and people there even dress up, wash the dishes and move from one corner of the house to another with electronic assistants. To perform any operation you will need to press only one button on your cell phone and voila – all your work is done for you! Remember the Jetsons who have illustrated us the futuristic world of the year 2060 with humanoid robots, aliens and fancy technical devices. Like it or not, the show became some kind of prophecy because, nowadays, we have got smart phones and smart watches and a lot of smart machines that help us about the house every day. Perhaps, we will have even flying cars in the nearest future? Who knows! For today, the primary goal for most companies is the invention and distribution of smart devices for people’s dream houses. Very soon we will all live in so-called "smart homes" where everything is done to improve living conditions. Hundreds of billions US dollars are expected to be earned by the year 2019, delivering about two billion house appliances all over the world. Because of widespread popularity of smart phones and easy availability of sensor chips it will soon become possible for many devices of the future to integrate with your houses. But some drawbacks of these devices are already visible today. Let’s take, for instance, a coffee maker that is connected to your smart phone. It seems incredibly convenient to make coffee just from your bed with the help of a simple application on your phone. But let's not forget about coffee machines with timers. They are very easy and comfortable to use despite the fact that they have been invented not tomorrow but much longer time ago. Will people, who are already using them for many years, buy new machines just because of the possibility to control them with the help of their phones? And what about devices that control house lightning? There are also some applications for smart phones, but isn’t it easier to go and just turn it off despite of looking for special apps? It is not difficult to guess that people will not download a separate application for each device and then search among them the right one to turn on the light, for example. It is easier to go and do it yourself. It seems that all these sensors only complicate our life but not simplify it. Perhaps, it would be much better to abandon the use of smart phones and come up with the latest technologies for home control. Several factors will help to make it possible. With the help of some apps, you can safely protect your home from unwanted visitors. In the nearest future you will open the door without the key or phone. A special sensor will recognize the owner of the smart home by his eye retina or skin structure. What can be easier and more convenient? All sensors should be integrated with a house for not to be controlled by other devices. Let's look at the case with the light. To make the lighting control easier, you just need to add a motion sensor into your house. You enter the room and the light is turned on, you go out and the light immediately turns off. Imagine the house of the future that knows your habits - sleeping time, meals, the beginning and the end of the workday, etc. Very soon, there will be developed special algorithms that can monitor your behavior and habits and adjust themselves to you. A home computer will always watch the movement of objects in the house and especially you. All devices will learn your habits and anticipate your future behavior. There will be no need for you to start an alarm every day because your computer will do this for you. Even if you are not at home smart devices will simulate your presence and change the behavior when you come back. Eventually, your house will become special and not alike someone else’s one, because everything in it is set up on your habits and behavior. Perhaps, almost everyone dreams to live in a convenient home with low prices on housing utilities. Your dream will become true in the nearest future. 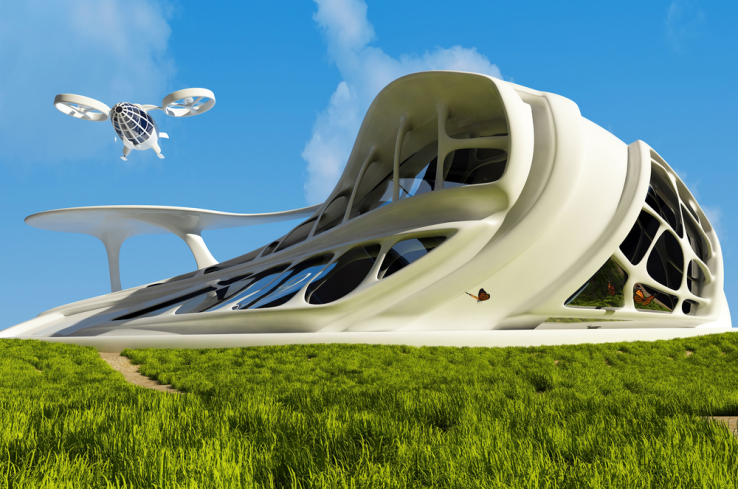 Smart materials will make your house save energy and save your money. Let’s take, for example, smart glass in windows that darkens automatically when it is too light in the room. You will need no shutters at all. 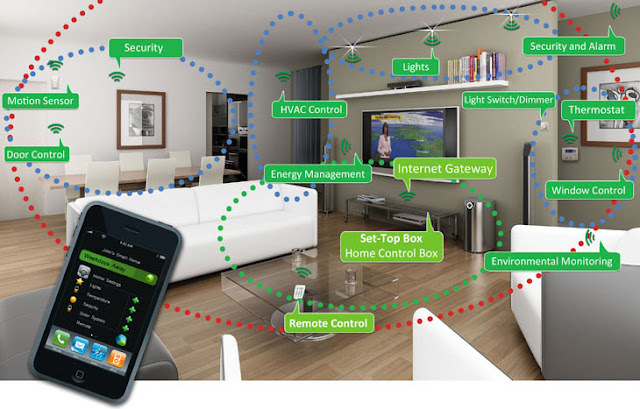 Thanks to increase of the digital layer of some devices, things at your smart home will become cross functional. For instance, a light bulb can turn into a security system. Sensors can feel unwelcome presence in the house and give a signal for protection. It seems that regular alarms will soon become out of date. Today, people direct all their energy on making life easier and welcome to their houses new technologies. Some devices complicate everything, such as those controlled with the smart phone. And some of the latest technologies surprise us with their simplicity and are really able to help us.